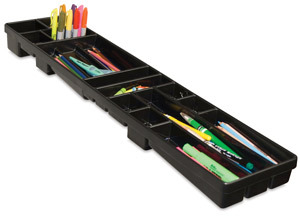 The Studio Designs Optima Art Tray transforms most any table into an art station! Made of durable ABS plastic, it features 16 separate storage compartments for holding art supplies and tools, plus a removable water tray. The Optima Art Tray easily mounts to either the right- or left-hand side of the tabletop. It measures 2½"H × 7"W × 31"L overall.